While I was on my business trip in the city of sin, I admit I was for the most part, a total dweeb. Most of my colleagues boozed it up and partied down (and made sure everyone knew it the next day). I, on the other hand, was content to stay in my little hotel room, order room service, knit and watch tv. 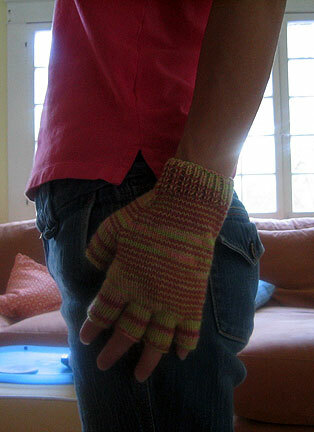 I took along these piquant little Knucks, the fingers of which I finished (for both hands) just before I left. Thankfully, my Holz & Stein dpns made it through airport security with nary a second glance (which is a good thing, because I would have hauled out and driven to Vegas if they tried to take those babies away from me). I had to tink the first glove back a few times because my blurry eyes skipped something in the pattern - i.e. in "repeat these 3 rounds," I apparently blocked "these 3" and the pluralization of "rounds" from my sight and just did the decrease round six times. (I was all excited, too because I thought I was already done. Dork.) 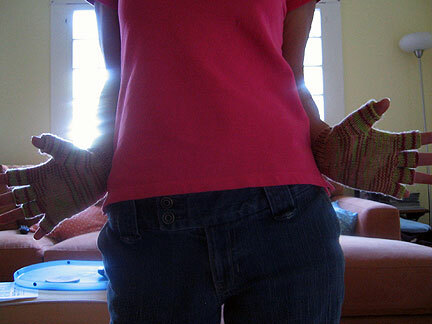 Or my bumbling hands dropped a stitch - which I didn't realize until several rows later. Or my distracted, Friends-watching mind got mesmerized by stockinette and skipped a decrease. Pattern notes and mods: The pattern itself was easy to follow, but I'll be honest - joining the fingers and thumb as written on the first glove, with all of the stitches on just two needles, was a biotch. No, make that a Biotch with a capital B. Hopefully there were no children listening through the walls in the adjoining rooms, my Deadwood-like language may have scarred them for life. So, for the second glove, instead of putting all of the stitches on two dpns, I only put half of them onto a dpn and left the other half on the waste yarn. Ditto when adding the thumb. A little more high maintenance but SO SO SO much easier. Since I am not a delicate flower with dainty hands, I cast on for the men's size to get the appropriate number of stitches and knit the length according to my hand measurements. I'm also going to skip the embroidery, because with the 85 shades of pink and green, adding anything else may inadvertently cause blindness. Yarn thoughts: I used Artyarns Ultramerino 4 that was a very generous extra in a knitty swap. It knitted up pretty smoothly and survived the frogging quite well. I handwashed and popped them in the dryer for about 15 minutes last night and they came out just fine. A teeny bit of fuzz but the wonderful, cushy, stitch-softening kind. I've only worn them for a few minutes (it was over 100 today), but they felt pretty comfy. They were a wee bit uncomfortable pre-wash - not mohair itchy but just a bit hot under the skin if that makes any sense. This seemed to abate following a soak in Euculan. I'll have a better idea of how my skin deals after this hell-like heat wave breaks. Or I could just take them to the office, since they seem to like that meat-locker setting there. The colorway I'm still not sure about. I like it, I just don't know if I love it. I dig the Charlie Brown-like stripes in the fingers, but the jury's still out on the rest. So if I knitted, say, 75 pencil covers, I'd think it was fabulous. Right now, though, my initial thoughts are that it's prettier in the skein. But it might grow on me, because overall, this project came out quite the cutie patootie! Mods: Joined fingers on second glove using 4 dpns instead of 2 (highly recommend). Lessons learned: 1. Go forth and piquant! 2. Don't judge a skein by its cover.